Try the program out, see if you like it. If you don't, shoot us an email within 90 days and we'll refund every penny. 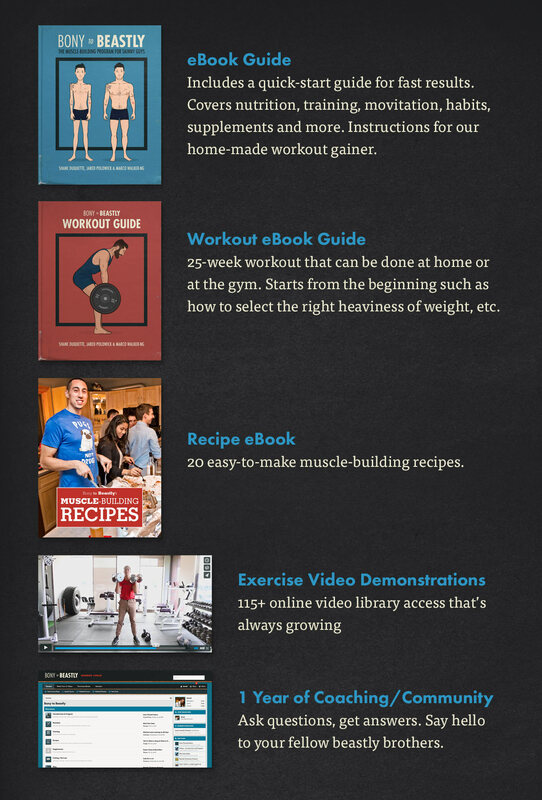 250-page Bony to Beastly eBook Guide. We'll teach you the 3 fundamental principles of muscle growth, then how to hack your appetite, and then every single proven way to build muscle more quickly and more leanly. Gain-Easy Recipe Book. 15 of the best recipes for bulking. Designed to get you ideal results while being easy on your appetite, easy to prepare, prepared in bulk, portable, affordable, and delicious. 5 months of expertly-programmed workouts. A ruggedly scientific approach to lifting weights. Exercise selection, volume, rep ranges, intensity—everything 100% optimized for rapid, aesthetic muscle growth… all simply laid out and easy to follow. Weightlifting video course. Marco will teach you every single lift in the program, starting with easy lifts and progressing to advanced ones. Even if you're new to this, you'll be great by the end. Yearlong (renewable) membership in the coaching community. Get feedback and coaching, track your progress, celebrate your victories, and be surrounded by guys on the same journey that you're on. We leave no bony behind. Dozens of free bonuses in the community. Skinny-fat? Want to improve your cardio while bulking? Fix your posture? Maximize your testosterone production? We've got guides for all of it! Bony to Beastly: The Program One payment of $197, Save $37! You'll get all of this instantly. The Beastly Guarantee. We have a guarantee for a full refund within 90 days.